Boyle Heights demands justice for Jesse Romero on second anniversary of slaying by LAPD | Fight Back! 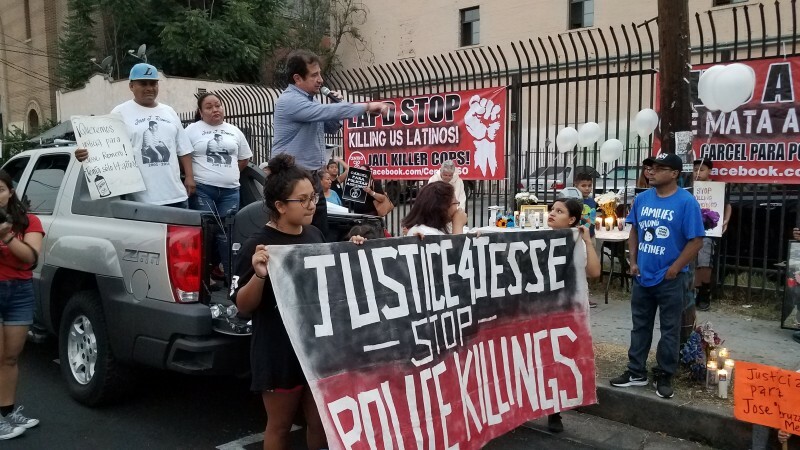 Los Angeles, CA - Two years after the LAPD killing of 14-year-old student Jesse Romero, the Boyle Heights community united to demand “Justice for Jesse.” About 50 people gathered at the intersection of Breed Street and César E. Chávez Boulevard, the site where Romero was killed, to hold a vigil and protest. Throughout the day, a national call-in day was held to demand L.A. District Attorney Jackie Lacey jail and prosecute killer cops. On August 9, 2016, during rush hour, LAPD officer Eden Medina and another cop chased Jesse Romero from an apartment complex after an alleged graffiti tip. Medina chased Romero through César E. Chávez Boulevard for less than a block and, upon nearing the corner of Breed Street, shot him. Cars and pedestrians breezed by since it was the middle of rush hour. Three witnesses say that Jesse was shot and killed while unarmed. Body cam footage was recently obtained by the Romero’s lawyer, Humber Guizar, in which Medina is observed beating his chest out of pride that he killed another person. Only 12 days earlier, Medina had shot and killed another Chicano young man named Omar Gonzalez. The footage from Romero’s killing showed that no first aid was ever administered or even called upon; and LAPD officers forcefully flipped Romero’s lifeless body onto the cement face down, and then handcuffed him. The vigil was organized by Centro CSO (Community Service Organization), which has led the fight against the nine LAPD killings in Boyle Heights since 2016. Centro CSO has united families and community to demand jail for killer cops. Among those gathered were Jesse’s parents Teresa Dominguez, Jose Romero, their lawyer Humberto Guizar, Black Lives Matter-L.A., Latino Equality Alliance, March & Rally Los Angeles, Catholic Worker, and Freedom Road Socialist Organization. Also joining the event were other families who lost loved ones to killer cops and sheriffs, including the families of Jose Mendez, Edwin Rodriguez, Eric River, Johnny Anderson, Cesar Rodriguez and Christian Escobedo. A pre-trial hearing rally will be organized by Centro CSO around October. Organizers ask that you stay connected with them through [email protected] or by calling or texting 323-943-2030.